In my lecture on "Emulation, Originality and the Writing Tradition," I drew on Mary Oliver in A Poetry Handbook discussing a quote by Flaubert she keeps close to her writing desk, and which she originally came upon in Van Gogh's letters: "Talent is long patience, and originality an effort of will and of intense observation." I like this quote, because it implies that not only talent but originality are functions--not of innate gift, but of learned behaviors such as patience, will power, and intense observation. I would contend, also, that Oliver's ability to write successfully about as timeless and universal a topic as nature depends upon, and is a function of, her own powers of intense observation. Grief is also a timeless and universal topic. 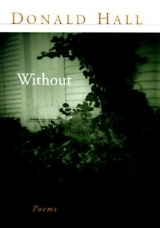 In Without, it is Donald Hall's keenly remembered details which strike me with a harrowing veracity. He demonstrates so many of the nuances of grief through carefully chosen details, bringing me in to each experience almost tactilely. The poems in this collection work together to form a compelling narrative, however nearly any one of them could also stand alone to illustrate a variety of points about how Hall treats such a difficult subject with such startling honesty. Consider the title poem, "Her Long Illness:"
What I noticed immediately is that this poem was set in the third person. This seems to serve two purposes: first, to defeat any quality of self-pity that comes through the inherent narcissism of first-person address. Second, and perhaps more importantly, this choice, and his subsequent choices to weave between first and third person in his poems, seems to resonate with my own experiences of navigating very challenging circumstances surrounding the loss of a love--that there is this sense in which one feels both present in the experience, and also observing it all from afar. Beyond this, probably the most poignant moment in this piece is the simple phrase "they pushed the IV pump / which she called Igor." This moment demonstrates his dying wife Jane's sense of humor in the midst of the surreal difficulty of her cancer treatment. These are moments that seem, like so many moments in each poem, as though they simply could not have been made up. They represent the real and specific human element in the face of something as universal as loss. The development of the poem is also significant. Hall proceeds having paved his way into the poetry of the scene using internal rhyme and spare, observational language. The line "chemotherapy dripped / through the catheter into her heart." is actually startling for the fact that this is the physical heart, not a metaphor--startling for its reality. Moments like these continue throughout the poem, such as in recounting how they "affirmed / their love for each other, witlessly" set next to his mundane bedside activities such as reading the newspaper, drinking coffee, and pacing. Through all of this, I found myself startled--not at the poet's consummate skill or unique technique--but at the sense of recognition; that in such careful choice of seemingly actual details, Hall has placed me, through resonance with my own past experiences, in his world. This book, to me, is a remarkable treatise on honesty in the face of loss, and on the power of intense observation to communicate even the most difficult of human experiences. Categories: Books, Grief Recovery, Insights, and Poetry. Poets: Donald Hall.